(Bloomberg) -- Chip stocks ended Thursday’s session within a hair’s breadth of their year-old record after comments from Micron Technology Inc. further boosted investors’ confidence that the worst of a profit-draining downturn in semiconductor demand is over. The Philadelphia semiconductor index surged as much as 4.2 percent before paring that gain to 3.5 percent. It ended the session at 1,442, less than 5 points short of its record closing high in March 2018. The 30-member industry benchmark has bounced back 35 percent from its December low. 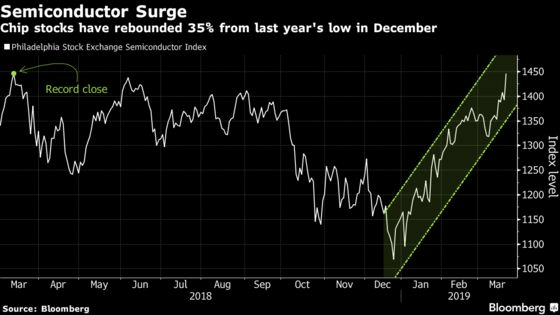 Semiconductor stocks have been rebounding amid predictions from industry executives that the slump in demand that drove last year’s sell-off is poised to recede. Their comeback is outpacing gains for all 11 main sectors in the S&P 500 Index, which is being led by a group of technology stocks that includes a number of semiconductor companies. Micron, the largest U.S. maker of memory chips, gained 9.6 percent on Thursday, the best performance in the industry benchmark. Trading volume was more than double the three-month average as investors looked past a less-than-stellar near-term forecast and focused on the promise of a second-half memory market recovery. The rally extended the stock’s post-Christmas advance to 52 percent. Advanced Micro Devices Inc. has bounced back the most from the depths of last year’s decline, jumping 68 percent. Programmable logic maker Xilinx Inc. and MKS Instruments, which makes semiconductor manufacturing equipment, rounded out the top three with gains of more than 62 percent.